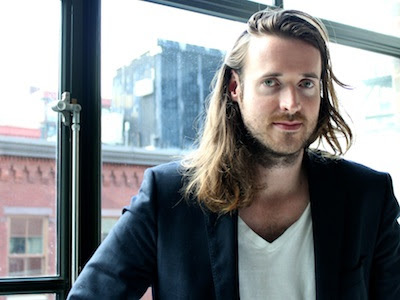 With Another Earth, debut filmmaker Mike Cahill helps boost a new emergence of shoestring-budgeted arthouse films, which tackle big-budget concepts and prove there’s ample room for intelligent life in the sci-fi genre. BIG-BUDGET SCI-FI CAN show you anything you want. Hollywood has successfully stripped your imagination of its limits. Unfathomable is the new commonplace. Odds are you barely batted an eye when Harry Potter and his pals soared before your eyes on the back of a photorealistic dragon, or when Jack Sparrow was swarmed by a ravenous pack of perfectly plausible mermaids. The downside to the constant wow is desensitization. In response, indie film has been increasingly tackling bigbudget premises with low budget productions, aiming to bring some gritty verisimilitude back to the sci-fi genre. Though bankrolled by Peter Jackson, District 9 seamlessly blended first-rate effects with an exotic, documentarystyle war zone. And just last year, with his film Monsters, CGI-artist-turned-director Gareth Edwards showed how a great creature feature could be made with little more than storytelling savvy and a laptop computer. continued in a car, then continued at a train station, then concluded with a phone call), Cahill talked space, cinema and the enduring powers of both. R. Kurt Osenlund: Are you an astronomy nut? Space junkie? Mike Cahill: Am I an astronomy nut? I mean, I’m obsessed with Carl Sagan and particularly [Sagan’s former assistant] Dr. Richard Berendzen. He lectured on pulp physics. I had this audio book of his that I used to listen to while driving. What was so beautiful about what he did was he took the mysteries of the cosmos and told them through emotional narratives that a layperson could really comprehend. I sought him out and asked him to be part of the film and he basically accepted. So yeah, I guess you could say I’m an astronomy nut. I haven’t studied astronomy but I do love it. RKO: The timing of the final shuttle launch is great for your film. What was it like to find out that such a momentous event would be closely coinciding with your movie’s release? MC: At the time, I was thinking, well maybe there can be an infusion of passion for the stars and maybe there can be noises made and ideas shared. I think it’s sad and yet, maybe this will reinvigorate a certain amount of passion for space discovery. It’ll probably raise interest in the film, too, which...well, that’s an interesting point. It’s weird—life is like that. We find connections, and yet, sometimes it’s just so random. But I never would have dreamed it was going to work out this way. MC: Well, the idea stemmed from a notion of string theory in the multiverse—this parallel world which mathematically seems to be theoretical to the next. Current theoretical physics seems to be suggesting that there is a multiverse, or there are parallel universes. The simple way to explain it is that the universe is infinite, and yet the particles in the universe are finite. The strange quality of an infinite universe and a finite number of particles means that, much like a deck of cards, it is shuffled an infinite amount of times. If you shuffled a deck of cards an infinite amount of times, you will come up with an order that is exactly the same but one card is swapped with another. It has totally different implications in the world of science, but we took that and used it by putting this new Earth in our orbit, or next to our orbit, so that there was a possibility of actually confronting the self. It’s like bending science for the purposes of metaphor. Small budgets, big concepts: "Primer," "Monsters"
MC: Haha, yeah, tell me if this is boring you! It can get very nerdy. But, basically, I took that notion and put it through an artistic lens. The rules were such that this other Earth was hidden on the opposite side of the sun. How it arrived there is a mystery—perhaps through a wormhole connected to a parallel universe. We did establish certain rules and followed them, and at one point I thought of putting them in the script [more explicitly]. But it just seemed to be more something you were lectured on and less something you felt emotionally, and I wanted to stick to the emotional aspect. RKO: Earth 2 is always literally looming overhead in this movie, and it seems to be alternately growing and shrinking. Is there an exact science to its proximity? Because as it changed in size, I was reminded of the original King Kong, and how there were size variations in the puppets they used. MC: It’s a combination of things, really. The planets are supposed to be on interconnecting ellipses, so it actually really is moving closer to us. It starts off as a tiny blue dot in the sky and by the end there’s this looming, iconic earth up in the sky. But all of that’s essentially a poetic reference. The idea is that the exterior world mimics or reveals the interior world of the character. So, in some ways, the encroaching closer and closer intensifies as the drama gets deeper and deeper and the stakes go higher and higher. It reflects that in a tonal way. RKO: Rhoda keeps an image above her bed. It’s of a nebula, if I’m not mistaken, and it’s an image I actually took from a childhood textbook and held onto because I found it so fascinating. I was struck by it in the movie. Can you tell me where you got it and why you chose to use it? Anything particularly special about it? MC: Oh, wow. Well that’s one of the Hubble Telescope’s first images after they fixed the blur. When they first launched the Hubble, the image they came back with was a laughing stock, because it was out of focus. So they sent a team up to fix the calibration of the focus, and that image—which is a three-pillar nebula that shows the birth of stars—was one of the first things that came back in focus. I love that image because it’s iconic of the universe and the creation of a star, the genesis of a star, which is really powerful. Rhoda’s obsession is the stars and it symbolizes her passion. 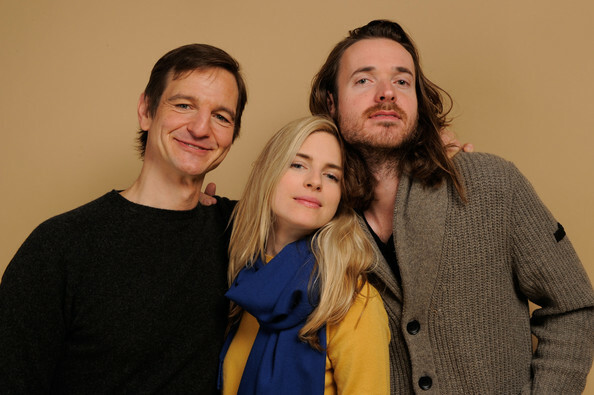 Co-star William Mapother, Brit Marling and Cahill at Sundance 2011. RKO: Rhoda is a 20-something ex con presented with the contrasting successes of friends and family members. It’s like the world is passing her by. As a working artist who’s chosen to pursue dreams that don’t exactly follow a set model of rules, have you ever looked around at peers and felt similar feelings? Have you ever been Rhoda? years she spent in prison were the four years he spent in college. And now he’s off to business school in Boston. I can identify with that. America is such a place where there’s the progression from high school to college and then from college to life after college. So there’s this sense of where you’re supposed to be, which feeds into the movie’s notion of these ideal paths we’d like to take. But life doesn’t always work out that way. RKO: There’s very little interaction with Rhoda’s family in this film, or at least her parents. We don’t quite get a sense of what they think about her circumstances. Did you intentionally alienate her? Or did those relationships just not fit into the story you were trying to tell? MC: There was a lot more interaction with the family in the script, but the first edit was two hours and 40 minutes. I cut a lot of it. There’ll be about four or five scenes in the extras with the family. They struggle with trying to help Rhoda reintegrate into life and she kind of rejects it. But it felt a bit tangential to the ultimate story—I wanted it to be a nice and tight 90 minutes. RKO: Without giving too much away, there’s a love story in this film, and there’s a point where it crosses a very crucial boundary. What is the moment like when you decide to cross that boundary, and why did you choose to cross it? Was it always written to be the way it appears in the film? MC: It was. And it’s a very crucial moment because the kinds of stories that interest me the most are not just the stories where the protagonist has to choose between right and wrong, because it’s obvious what they should do—they should choose what’s right. I prefer when the choice is more complex. The scene in which they have that passionate night together...in some ways it’s right because they’re in love. It’s a beautiful moment. However, its only beautiful in the world that they’ve created together, and if that bubble were to burst—which, eventually, it probably will—the fall from that levity they have will be even steeper. So the stakes go higher. I like that notion that one really has to reckon with the idea—what is right and what is wrong. And, here, what can be perceived as wrong also can be perceived as right if you don’t acknowledge the past. I like the complexity of that situation. RKO: This is a movie that’s basically tethered to one very big idea. It’s right there in the title. What’s more important for a filmmaker—a strong core idea or strong execution? MC: I think those two...it’s hard to put one as more important because a great core idea that’s executed poorly does not transfer anything. It becomes unarticulated. So the execution is vital, but the strong idea allows for the imagination to roam, so I think the two work in tandem with one another. This is a concept that opens up so many different possibilities and so many different stories and it’d be fun to tell many more. RKO: When Another Earth was screened at The Franklin Institute last month, a woman in the audience remarked about how there aren’t many events anymore that unify Americans—or the world, for that matter—the way the original moon landing did. Do you think we’re still able to experience that sort of collective awe, and do you think movies have the power to create it? MC: I definitely think movies can do that. Movies can move people in collective groups, and allow them to connect on an emotional level. The moon landing was an emotional experience that people shared together, and cinema is something that’s an emotional experience that people share together. It becomes one of those things that unites and I think one of the big questions we ask—one of the things we deal with in the film—is the question of our aloneness in the universe, as a society and and as individuals. To escape that loneliness is a deep primal urge that we have. I think through cinema, we can connect. RKO: Finally, the inevitable question—If you met you met the other you, what would you say to him? MC: I’d ask if he’s lived a meaningful life. And if he’s making movies, I’d tell him I’d like to see them and that he should watch this one!